Two balls. Extra players are behind 2 and 4 on the sidelines. 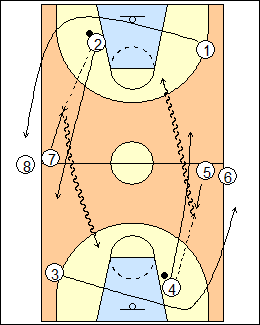 1 rebounds and outlets to 2, who comes back to meet the pass, dribbles fullcourt for a layup, 1 follows the pass to the back of the line. 3 and 4 do the same on the other side. 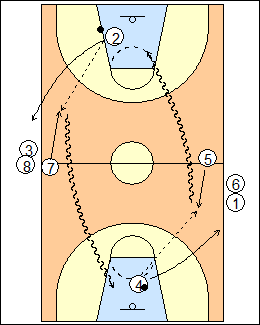 2 and 4 rebound their shots, outlet to the next player in line and follow their pass. Progression - use 3 or 4 balls (option - start from one end). 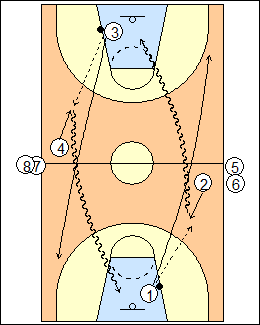 See Layups - Pau (speed), Press break - Press-break layups, Fast break - 1 (secondary), Outlet and go. 1 outlets to 2, who drives and 1 fills behind, 3 and 4 do the same on the other side. 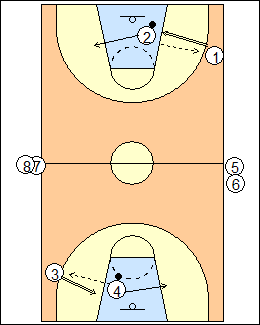 2 and 4 pass back for shots and get to weakside rebounding hot spots. 2 and 4 rebound, outlet and are the next shooters, 1 and 3 go off. 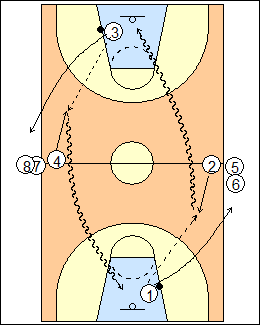 See Fast break - Continuous flow, 2 (secondary).